As a part of the leadership in my church, I visit group meetings to support what God is doing in the lives of the leaders and members. Two meetings vividly stand out because of their stark contrast. As I sat in the first meeting, the leader treated it like a mini-church service. He asked the ice breaker question to open but only let one or two share before quickly moving on. After worship, we opened the Scriptures. With a Bible in one hand and a document that looked like a manuscript in the other, the leader proceeded to dominate the meeting for the next 40 minutes. He answered his own questions and even controlled the concluding prayer time. Honestly, I could not wait to get out of there, and by the looks on the faces around the room, I was not the only person feeling this way. The second meeting was quite a different experience. Actually, I really did not want it to end. When the ice-breaker was presented—not by the leader by the way—everyone shared some quite silly responses. Another group member led us in a simple time of worship. Then the leader opened up the discussion of the lesson. Leaders don’t have to do everything! While he was leading this part of the meeting, he only talked about thirty percent of the time. [i] There were lots of questions and interaction. We even stopped in the middle of discussion and prayed for one of the members. Then each member expressed personal needs in the prayer time. At the end, we migrated to the kitchen for refreshment and talked for another thirty minutes. The leader finally told people that we needed to honor the host and leave because the next day was a school day. Otherwise, I think people would have stayed much longer. These stories show two totally different group experiences and two very different ways of leading groups. According to legend, the mythical god Atlas was forced to hold up the heavens as a special punishment. Atlas couldn’t give his task to anyone else; it rested on his shoulders and his alone. Sadly, many leaders gladly imitate Atlas and prefer to chart their own course without the help of anyone else. Individualistic cultures like those in North America esteem those who “pull themselves up by their own bootstraps.” They would rather be burdened like Atlas than receive help from anyone. I remember one leader in Australia who told me that she felt no one in her group measured up as she crassly described her members as having mental issues. Everything depended on her because those in the group were weak, helpless, and even dangerous without her control. Like Atlas, she had to hold the group together by herself. No one was qualified to help her bear this burden. There’s another path, however, that works much better and makes groups thrive. Fred illustrates this. He diligently prepared all week for his Thursday night group. Everyone expected he would give an exegetical teaching from the Bible, opinions from commentators, and illustrations. Actually, just the opposite happened. Fred spoke very little that evening. He asked others to lead parts of the meeting and to help him lead the Bible discussion. When he did speak, he drew out information from others. Although he had scrutinized the Bible passage over and over, he led the group to dig up the treasures for themselves. He peppered each person with questions that forced them to delve into the text. He placed the burden in the middle of the group and others picked it up. Self-sufficient leaders kill group life! In my conversation with the group leader in Australia, I encouraged her to recognize the Holy Spirit in each member and release them for ministry. She followed my advice and the group came to life. It shifted from her group to their group. After learning how to empower others, she eventually felt the liberty to start another group, knowing that the members were trained and could go on without her. Thriving groups are characterized by the phrase “our group” rather than Tom’s group or Betty’s group. Members take ownership for the vision and direction of the group and the leader is the facilitator who mobilizes the members. Life-giving groups get everyone involved because facilitators refuse to do everything. The members own the group and talk about it as their group. The group is NOT a repeat of Sunday morning. Thriving groups don’t hold up one person as the superstar. The members are not looking at Joe or Tammy to do everything. The group experience is not a repeat of the Sunday morning experience where one person preaches and others sit and listen. Rather, the members experience the freedom to minister to one another. People sit in circles, not at long tables or in opposing lines. They talk to each other and allow the Spirit to work in their midst. We questioned group leaders to understand how much they empowered members as opposed to doing everything themselves. 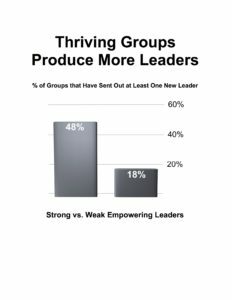 Those leaders who actively engage their members, delegate responsibility, and instill the “our group” mentality were far more likely to produce new leaders and new groups than domineering and controlling leaders produce, as the graph below indicates. Facilitator describes the leader’s role of empowering each member to develop and grow. Synonyms for empowerment include enablement, permission, and approval. Facilitators encourage people to step out, attempt new things, and even embrace the idea of making mistakes while they share, use their gifts, and contribute to the life of the group. When facilitators leave the group, members have the confidence to continue the group through the help of the Holy Spirit. Above all else, the members have learned to depend on God. When Brent first stepped into the home group, he was a mess—fearful, nervous, and self-conscious. He was not accustomed to communicating with others and felt like he had little to share. Over the years of sitting in church on Sunday, he had become conditioned to sit, hear, nod his head, talk to a few people after the church worship service, and then go home. He loved Jesus but had little community and interaction with others. When he first joined the group, everyone noticed his hesitancy. But they loved him, encouraged him, and told him to relax and enjoy himself. Weeks and months passed. Brent soon realized he was in a band of like-minded believers who loved him and had his best interests at heart. He could be transparent with them without feeling judged. The group encouraged him to participate and his confidence grew. Soon he was leading the different parts of the group meeting and even the lesson itself. It became apparent that Brent had a gift of teaching and often used it when sharing. Brent even learned to share his faith as the group went out into the community to pray with those who had needs. Brent rarely missed a meeting and even showed up early. The group became a second family to Brent, and in many ways, a more intimate family. Groups that involve everyone don’t have a problem keeping their people. Groups that involve everyone don’t have a problem keeping their people. Like Brent, the members don’t want to miss even a single meeting. The group becomes their family because they are loved and accepted for who they are. As the graph below shows, these groups are able to keep their people because those attending feel at home. Even the newcomers are soon talking about “our group.” One reason is because the facilitator is quick to ask, “what do the rest of you think?” knowing that thriving groups move forward as a team, in unity, and oneness of purpose. The fact is: people want to be a part of “our” group, not “your” group. In our research, we found that one statement correlated with unhealthy groups: “I like to lead the entire small group meeting myself.” This is a death warrant for small groups. It turns members into passive hearers, expecting them to sit in yet another meeting. The leader grows as he or she ministers, but the hearers don’t have a chance to exercise their spiritual muscles. But when the group shifts to our group, everyone takes ownership and works to help the group thrive and grow. This takes time, prayer, and effort. The reality is that there’s too much work for one leader to do alone. Prepare and facilitate all the various parts of the weekly meetings, making it look very polished and professional. Personally reach all lost friends for Christ. Meet with everyone in the group as often as possible to mentor and disciple them into strong believers. Train an intern or apprentice by having them watch what you do so that when he has his own group, he’ll know what to do. Those who empower members prepare the members to actively participate, be part of a leadership team, and eventually be part of a new small group. They understand that the small group is an excellent place to prepare disciples who make disciples. They are not afraid to ask Mary to lead the ice-breaker or to invite Jim to lead worship. Eventually, they liberate others to facilitate the lesson. They know that people learn best “on the job,” so they joyfully allow members to get involved. Kim and Kim Cole (yes, both husband and wife have the same names!) love small groups and have been part of a church in Pennsylvania that has been small-group focused since the late 1980s. I heard so much about this couple from the lead pastor that I assumed they must be dynamic, talented, and very gifted. When we met, I was surprised to notice how unassuming they were. They shied away from public leadership roles and were certainly not the superstar types. They freely shared their weaknesses and struggles with their small groups. I’ve had the privilege to talk with the Coles on different occasions and even attended their group meetings twice. They freely shared their weaknesses and struggles with their small groups. The Coles encouraged others to become active participants. They ask each member to lead the ice-breaker, worship, and lesson. They alternate among the willing members, encouraging each person to practice every aspect of group life. They even rotate the host homes among willing members, wanting to give each person the opportunity to practice the blessing of hospitality. The Coles simply participate like the rest of the group and stay mostly behind the scenes. In contrast, some leaders set themselves up as the Bible answer man or woman. No one else knows quite as much biblical truth as they do. The group turns into a study time. Members are expected to sit and listen. I visited one group in which the leader rattled off numerous Greek words. “Is she trying to impress me with her knowledge?” I thought to myself. I noticed a few thick commentaries on the floor, and she liberally quoted them, teaching 90 percent of the lesson. When others dared to comment, she hesitantly acknowledged them. Quickly, however, she cut them off, preferring her own authoritative voice. Some pastors actually promote this practice as they hang educational nooses on their lay people, expecting them to go through long periods of education before leading or even ministering in a small group. This approach has two fatal errors. First, it fails to acknowledge that the best learning is caught, not taught. Learning to lead is a process, so potential leaders cannot be “perfected” before they’re sent to do ministry. Leaders gain vital experience as they make mistakes, reflect on them, and chart mid-course corrections. The small group is the perfect laboratory for developing leadership. Potential leaders cannot be “perfected” before they’re sent to do ministry. The second flaw concerns the work of the Holy Spirit. A philosophy that relies on formal training for small group leadership often minimizes the power of, and the reliance on, the Holy Spirit. Take the example of the apostle Paul. During the first century, Paul established churches throughout the Mediterranean and left them in the hands of relatively new Christians. [ii] Why? He trusted the Holy Spirit to work through these young leaders. Jesus taught the multitude but spent the majority of the time ministering to his disciples. This might seem counterintuitive. Why not spend the most time with the most people? Why prioritize a group of twelve? Jesus knew that interactive, quality time with the few would ensure that his movement continue after he left. Teaching them in a crowd while they sat and listened was not sufficient to fully prepare them. He needed them to participate and learn from their experiences. This is how empowered Christians are formed. Quality time with the few ensured that Jesus’ movement would continue after he left. Jesus didn’t simply teach his disciples about prayer. Rather, he empowered them to pray by allowing them to see him in practice. When the disciples finally asked him what he was doing, he seized upon the opportunity to teach them about prayer (Lk. 11:1-4). Instead of offering a class on hermeneutics or exegesis, Jesus quoted Scripture in his dialogue and then explained the Scripture’s meaning to them (66 references to the Old Testament in his dialogue with the disciples). The same is true with evangelism. Jesus evangelized people in the presence of his disciples and then instructed them afterwards. He sent them forth to apply what he taught them. On one occasion the disciples reported to Jesus about their evangelism tour, “Lord, even the demons submit to us in your name” (Lk.10:17). Jesus seized the opportunity to instruct them further and to offer further guidelines: “. . . do not rejoice that the spirits submit to you, but rejoice that your names are written in heaven” (Lk.10:20). Christ knew that theoretical information separated from practical experience would have little lasting value. Give the disciples experiences and allow them to make personal observations. Use the experiences and observations as a starting point to teach a lesson. People learn best when doing, but they must not be left to themselves. They need personal supervision and guidance to carry on with the work effectively. Jesus chose the small group so no one would remain on the sideline. Jesus chose the small group setting so that everyone would be involved and no one would remain on the sideline. He encouraged his disciples to minister in the homes (Luke 9 &10), and after Pentecost his disciples met from house to house where everyone could participate and use their spiritual gifts (1 Peter 4:9). Small groups are the perfect setting for everyone to participate and grow. Empowering your members will create group ownership and turn your group into a dynamic, thriving small group. Fresh out of Bible school in 1981, I asked the pastor of my home church in Long Beach, California if I could teach a Bible study (I yearned to show off my newly acquired Bible school knowledge!). Every Tuesday night, I gathered a group of people in the small church bookstore to teach them the Word of God. I didn’t prepare questions, nor did I expect those attending to participate. I wanted those present to hear what I had to say more than I wanted to hear them. I had not yet learned the value of facilitating. Perhaps you are called to teach or preach. Look for opportunities to use your gifts. Just remember that the group meeting is not the place to practice this gift! Your job is to kindle participation among the group members. The small group focus is the personal application of Bible knowledge to daily life. It’s a time when confession, inner healing, transparent sharing and renewal happen. Your job is to kindle participation among the group members. Great leaders function as facilitators who serve the group and empower the members to enjoy God and each other. Rather than lording over the group, the facilitator, with humility ministers to them at every opportunity. The facilitator’s joy is to empower rather than impart knowledge. Effective facilitators encourage group members to speak what’s on their minds. They empower the group members through active listening. They realize that an important small group goal is to build up each member through active listening that results in edification. The facilitator might ask, “What do the rest of you think?” All members are asked to respond and add new dimensions. After everyone has taken a turn, the facilitator can then summarize the comments of the group. The root definition of “facilitator” is to make easy. The role of the facilitator is to make it easy for others to participate. Communication in a classroom takes place between student and teacher (question-answer). The teacher imparts information while the students take notes. Communication in a small group flows among all members. Elizabeth, a member of the group, feels just as free to direct her comments to John, a group member, as she does to Jane, the group facilitator. Often the facilitator simply observes the communication that’s taking place. The facilitator is not passive—but listens and lets others share. Don’t wait too long to use your gifts and talents. You can’t grow unless you exercise your muscles along the way. A farmer wanted to enter the world of horse racing, so he bought a beautiful race horse. Every day he washed the horse and groomed it. He didn’t want to exercise the horse for fear of wearing it out, so he used his faithful mule to perform the farm chores. On the day of the big race, his prize horse could hardly move. His muscles were flabby and atrophied. The farmer had no other choice except to enter his mule in the big race. Don’t sit on the sidelines waiting for the big race. People learn best while practicing what they’re learning. Some think it’s best to wait until they really know the Bible. “You’ll never have enough Bible knowledge,” I tell them. “Even recognized, highly skilled Bible teachers are continually learning. People learn best while practicing what they’re learning. Others think they must wait until they’re ready to answer any question. “You don’t need to answer every question,” I tell them. In fact, I encourage this response to difficult questions: “I’m not sure how to answer that question, but I’m going to look into it this week, and I’ll get back to you.” This humble stance will create confidence between you and your members. During the week, you can study the Bible, read Bible commentaries, and go to your supervisor or pastor to ask for help. Many misconceptions abound about leadership. Many still believe that small groups and Bible studies are the same thing. For many, group leaders are Bible teachers. The reality is that few small group leaders are qualified to teach. The best group leaders are facilitators who transparently share their lives with those in their groups, praying always that Christ will be formed in a new way within each person. Because small group ministry focuses on raising up facilitators as opposed to Bible teachers, I do not believe that it is essential that a potential leader be required to be an expert on Bible doctrine, be a gifted teacher, or even be a recognized leader in the church in order to lead a small group. If a person has demonstrated his or her love for Jesus Christ and if that person is walking in holiness, small group leadership is a distinct possibility. It’s not essential to be a gifted teacher to lead a great group. What skills are necessary to facilitate a group? [vi] At least two: They’re summed up in the great commandments—love God and love your neighbor. All small group leaders must abundantly possess these two characteristics. Are you growing in your love relationship with Jesus Christ? Are you enjoying his love letter to you on a daily basis? God uses people who are growing in love with him. Your success as a group leader depends on your love for the group members. I was born and raised in Long Beach, California, which is part of greater Los Angeles. My dad would occasionally take me and my brothers to the Fabulous Forum to see the Los Angeles Lakers. I’ve watched superstars like Magic Johnson, Kareem Abdul Jabbar, Shaquille O’Neal, and Kobe Bryant. Each of these stars excelled in their own way and were a pleasure to watch. They leapt, spun, and overpowered their opponents like Marvel comic characters. Yet unlike those Marvel comic superheroes, they were helpless to win by themselves. In fact, they were mostly defeated if they tried to personally dominate an opposing five-man team. The odds against them were just too great. Each of these stars needed a team to overcome the opposing squad. Even the famous Lebron James can’t succeed on his own. He tried unsuccessfully for years to lead the Cleveland Cavaliers to victory but failed each time without a strong supporting cast. Team leadership was the norm in the early house churches. In fact, every time leadership is mentioned, it’s always in the plural (Acts 20:28; Philippians 1:1). Those leading the early house churches depended on each other to make up for each other’s weaknesses. Group members benefit from receiving ministry from a variety of people and their giftings. Take turns leading the various parts of the meeting—including the small group Bible lesson. Rotate among the members to host the group. Get together outside the meetings with members to build relationships. Schedule small group planning meetings to talk about goals and direction. By involving others, the group will become an exciting place of ministry and growth. Empowering others to participate in the group requires forethought, prayer, assigning responsibility, and debriefing on progress. Empowering others requires effort. Doing it alone is far easier, at least in the short term. It is easier right now to do everything yourself. However, it’s far less work a month or two from now when others are carrying the load and owning the ministry of the small group. What’s more, it just makes the group more fun! And who doesn’t want that? What is the main principle you’ve learned from this chapter? How will you apply it? Does the group see the leader as a facilitator or controller? On a scale of 1-10, how empowered are the members of your group? 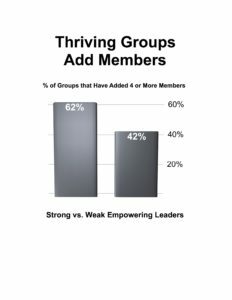 Describe some ways that your members are creating a thriving group? [i]70-30 Principle: The small group leader talks only 30 percent of the time, while the members share 70 percent of the time. This should be the goal of every small group leader. [ii] Roland Allen, Missionary Methods: St. Paul’s or Ours? (Grand Rapids: Eerdmans, 1962), pp. 84-94. [iv] Inductive Bible Study”Inductive Bible study involves observation, interpretation, and application of a Bible verse or verses. It takes place when a person draws conclusions based on the plain biblical meaning, rather than simply accepting the commentary of an outside Bible authority. [v] Barbara J. Fleischer, Facilitating for Growth (Collegeville, MN: The Liturgical Press, 1993), p. 21. No one particular gift stood out as more important. Small group leaders with the gift of teaching were no more prone to multiply their group than those with the gift of mercy. There was no one particular gift of the Spirit, such as evangelism, that distinguished those who could multiply their groups from those who could not. Excuse #1: “I have very little time.”All of us have the same amount of time to invest; the key question is how will you invest it. Excuse #2: “I haven’t been trained.” The basic prerequisites for leading an effective small group include: Love for Jesus, Love for his Word, and a desire to minister to others. Small group leaders never feel they have enough knowledge. All small group leaders are growing and learning. Excuse #3: “I’m not mature enough in the Lord.” If you’re a young Christian, hungry for Jesus, with a desire to serve Him, leading a small group will provide an important stepping stone in your spiritual growth.